Using volume in your trading is a difficult skill to master. Hence, traders might find volume trading indicators useful. But unfortunately, some volume trading indicators have many inputs and are hard to understand. 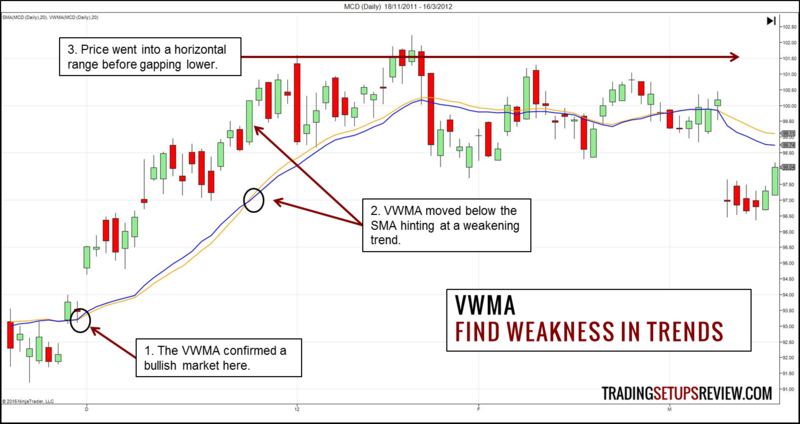 This is why the Volume-Weighted Moving Average (VWMA) is a great choice for new traders. What is a Volume-Weighted Moving Average (VWMA)? 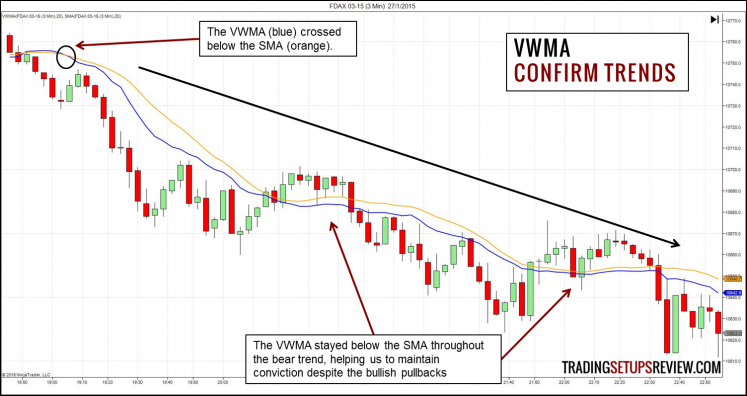 Compared to indicators like On-Balance Volume and Ease of Movement, the VWMA is simple. A Simple Moving Average (SMA) is an average of the past N closing prices. It give the same weight to every closing price. A Volume-Weighted Moving Average (VWMA) is the same, except that it gives different weight to each closing price. The closing price of a day with high volume will have a greater weight. For e.g., if the volume of day 3 (V3) is higher, its closing price (C3) will have a larger effect. A moving average is a versatile tool. You can use its slope as a trend filter. You can compare the price to its moving average to decipher momentum. You can also watch the moving average as a support or resistance level. For a price action trader, these are solid methods to trade a moving average. But they miss the point of the VWMA, because they do not make use of the VWMA’s unique volume attribute. To fully make use of the VWMA, compare it with a SMA that does not include volume. The SMA is a benchmark. This means that you should choose the same look-back period for both the SMA and the VWMA. The only difference between the two moving averages is volume weighting. What matters here is the gap between the VWMA and the SMA. Their difference shows the effect of volume weighting. Generally, volume should increase along with the trend and decrease against it. Hence, generally, if the VWMA is above the SMA, it means that volume has been higher on up days. When the VWMA is below the SMA, it shows that down days had higher volume. The chart above shows the FDAX futures contract in a 3-minute chart. The blue VWMA stayed below the orange SMA and confirmed the bearish trend. This assurance is helpful for traders who are trying to let their profits run. This is a daily chart of McDonald’s Corporation (MCD on NYSE). It shows the VWMA moving below the SMA. It was a stark warning that the bullish trend lacked volume support. Most moving averages issue reversal warnings through price crossovers. Hence, they do only after the market has reversed. Here, it is impressive that the VWMA warned us when the market was still bullish. This is a daily chart of Textron Inc (TXT on NYSE). It shows how the divergence between price and volume presents a trading opportunity. The VWMA is great for tracking the price-volume context. However, it does not trigger a trade. Use other indicators or price patterns as your trade trigger. 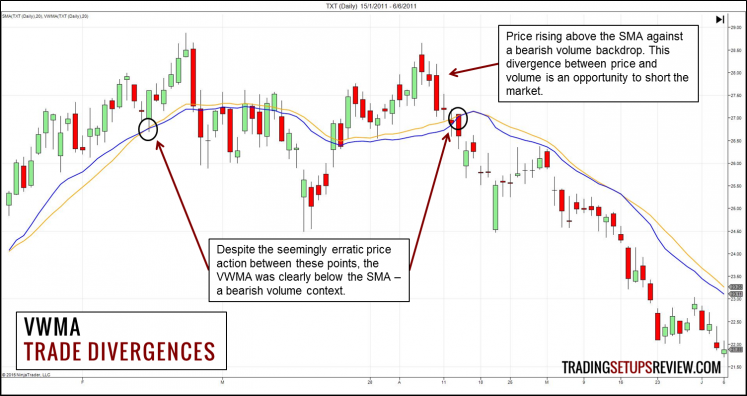 If you trade with the SMA, adding the VWMA is simple way to improve your market analysis. I used the 20-period VWMA as it is the common tool for short-term trading. You can apply the same concept using other look-back periods that are consistent with your trading time-frame. Using a VWMA with a SMA resembles a dual moving average system like the 9/30 trading setup. However, a typical dual moving average system does not feature volume at all. The VWMA adds a new dimension to the SMA, and does not just stretch it along the same dimension. The size of the space between the VWMA and the SMA reflects the effects of volume-weighting. Thus, when the VWMA is entwined with its benchmark SMA, the market is listless. In such cases, do not draw strong conclusions. In all, the VWMA offers a simple and effective upgrade for most traders. 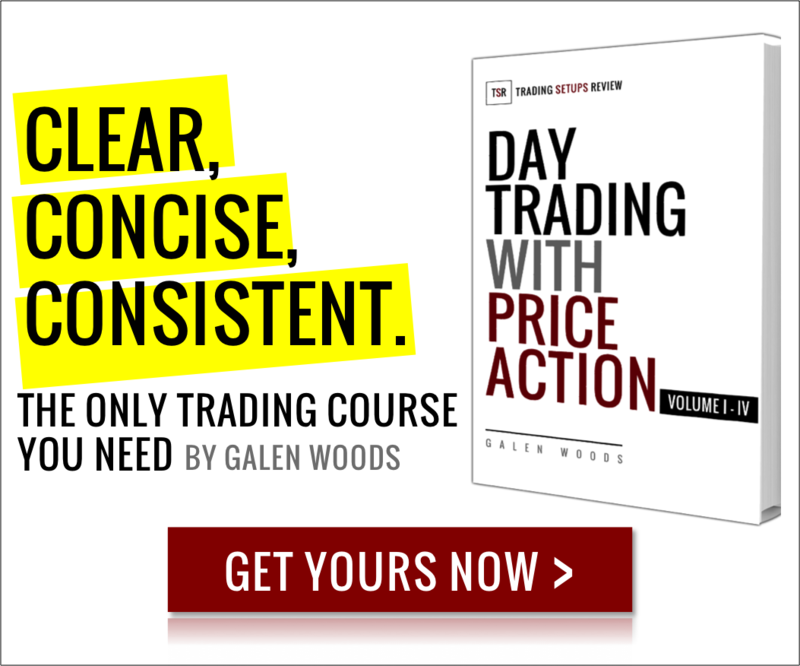 Tired of complex trading setups? Pick up a simple and versatile price pattern that works. Thanks for the VWMA explanation. Easy to comprehend and follow. Great examples. Looks like an excellent tool when combined with SMA for Large Index trading. Thanks for the comment. Glad you like it! With reliable volume data, the VWMA combined with SMA is indeed a useful tool for monitoring index ETFs. Thanks for the analysis on VWMA, its formation, calculations, comparism with SMA and its seeming functions in interpreting the trend/market. It really looks like an excellent tool I would want to be using in my trading activities. Can you please do me a favour? Can you show me where I can download this VWMA? I would appreciate receiving your reply through my email address. Where can I get the VWMA as shown in Ninja Trader? VWMA is included as a standard indicator in both NinjaTrader 7 and 8, so you don’t need to import it as a custom indicator. I have Think or Swim. Do you know how I can add this indicator into TOS? Script? Hi Kyle, maybe this page on VWMA will help. When I plug it into the think script editor, I get an invalid message statement. If you can get this to work please let me know. Buy if SMA VWMA,1) and HasData. Hi Penny, I’ve not used TOS in a while. Perhaps other TOS users could help? Or you can try leaving a comment on the website where you found the script. Could you do an review of VWAP (volume weighted average price)? Sure! I’ll look into it. Thank you for the suggestion. Hi Gomez, I just posted a new article on VWAP. Check it out here. Yup! it’s a simple tool that complements the usual MA well.